Our search engine now is capable of fast full-text search in concepts, definitions, user profiles and articles metadata (including abstract). 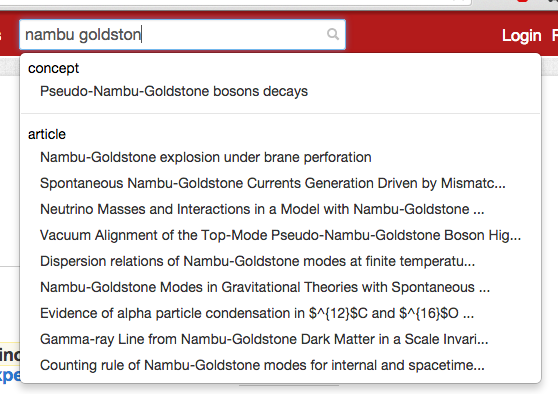 For example: search for "neutrino". In addition to that, we implemented an in-place autocompletion for the search widget in the page header, allowing you to find what you're looking for even faster. Help ScienceWISE new articles recommender to provide more relevant articles by following their authors. Generally, articles of the followed authors will score higher, so you won't miss a submission by a colleague. Along with the authors you followed explicitly, ScienceWISE will deduce your coauthors and scientists whose articles you frequently bookmark, helping you to follow relevant scientific topics without routine updates of your SW preferences.